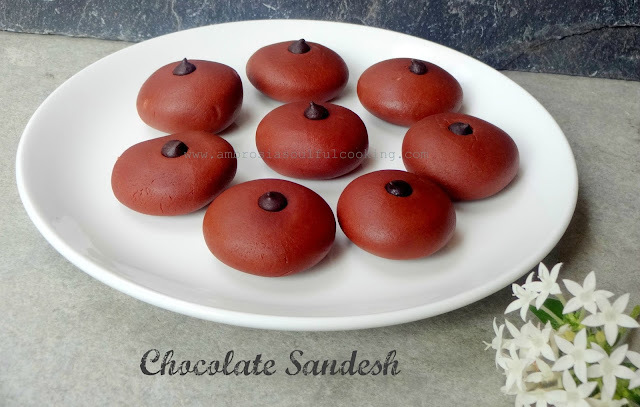 Sandesh is a famous Bengali delicacy. Made from fresh cottage cheese (paneer), it is delicious and light. 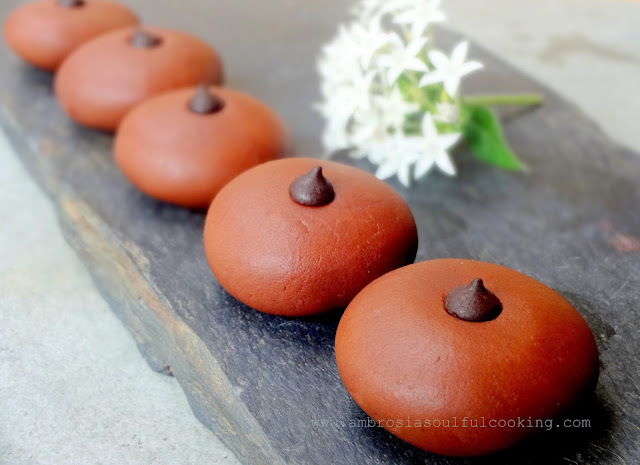 Talking of Bengali sweets always reminds me of our days spent with our aunt at Chittranjan Park where every evening we would walk down to a famous Bengali sweet shop and gorge on Sandesh and Mishti Doi. 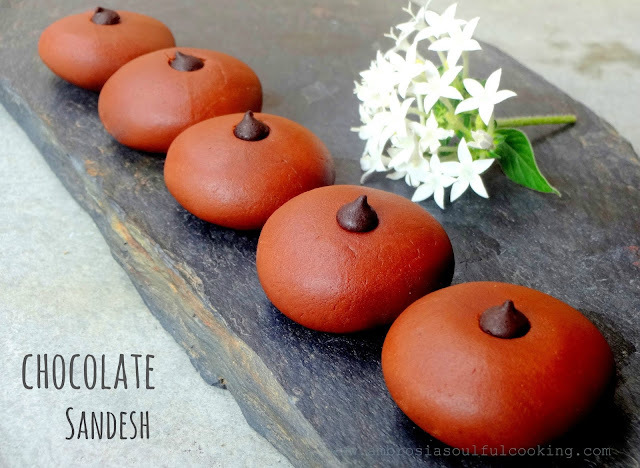 No amount of Sandesh seemed to satiate the cravings for this melt in the mouth sweet. This dessert invokes very sweet memories and has a connect with good times. It is a favourite sweet of our family. Yesterday there was surplus milk in the refrigerator. I made chocolate Sandesh. Boil the milk. Let it cool. Remove the cream (malai) from top. Boil the milk again. Add lemon juice. Stir till the milk curdles. The milk should curdle properly leaving green whey. Strain the cottage cheese (paneer) through a muslin cloth. Squeeze out the whey. Place the muslin cloth with cottage cheese under running water. Squeeze and hang for twenty minutes to drain out excess water. Transfer paneer to a mixer. Add sugar and cocoa powder and blend till smooth. Transfer the mixture to a heavy bottom wok. Cook the mixture on low flame stirring continuously. After few minutes of cooking, the mixture will become smooth and creamy. Keep cooking till the mixture begins to loose moisture and starts coming together. Turn off the heat when it comes together as a single lump. Cooking beyond this point will make it dry and rubbery. Transfer it to a plate. Let it cool. Knead warm mixture with the heel of the hand. Your hands will become greasy and the mixture will become smooth and soft. Pinch small balls of the mixture. Shape Sandesh and flatten them. Garnish with chopped almonds or dark chocolate chips. Serve. Keep Sandesh in the refrigerator before serving. If you do not wish to go through the rigmarole of making paneer at home, follow the quick version. Churn with sugar and cocoa powder in a blender. Follow the instructions above. My notes: Turn off the heat when the mixture becomes thick. If it gets too thick and does not shape, add some water and cook again till desired consistency is reached.